I haven't picked up my camera in weeks. I needed some inspiration! I had my daughter in to the dentist this morning. After she was done with her appt., we stopped at the beach. It was windy, raining, and cold. She had a frozen mouth still. 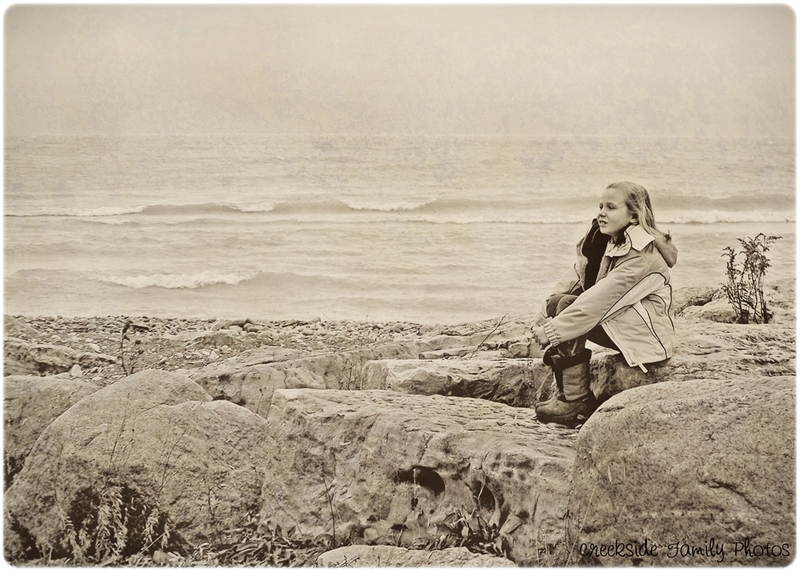 But, she bravely sat on the rocks on the shore of Lake Huron! I used PW's Heartland to get the colour, and also put a texture layer lightly overtop. Need some inspiration? Check out the other photos at i♥faces. OK, I LOVE this! And it does look like Ashley's LOL! Beautiful everything...little gal, processing...the whole 9! Gorgeousness!! Love everything about it!! ::HUGS:: I love it. And yours is in season. Great capture and I think the processing really works. Poor Becky looks cold and like her jaw is numb. I hate that frozen feeling after a trip to the dentist.... I'm pretty sure the Devil dresses up for Halloween as a dentist. I love it. Great photo. This is stunning!! I absolutely love the composition and processing! !